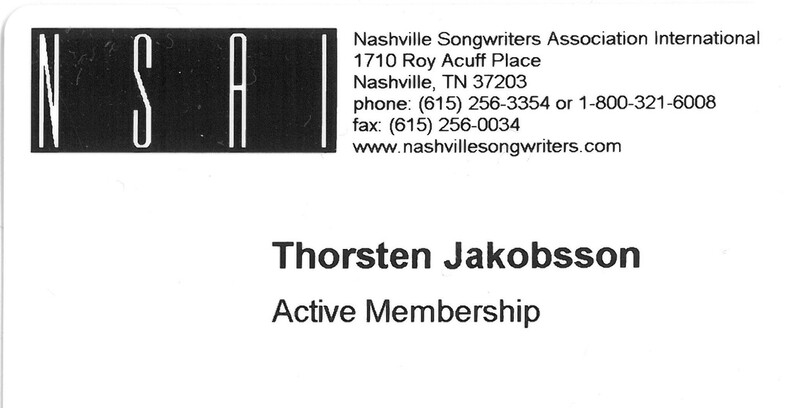 Recently I decided to join Nashville Songwriters Association International. I few days ago my membership card came home. I look forward to use the help from the organization to help me improve my songwriting. Thorsten, I am the Assistant Executive Director of Membership at NSAI. WELCOME TO NSAI! and thank you for giving us a chance to help you with your music. here is how to get started. you receive 12 song evaluations…send in a song! You receive our weekly Enews – watch all the quick tips and MAN vs. ROW is wonderful!! You receive 2 one hour mentoring sessions with one of our staff – so make use of them! You have our forums were you can connect – jump in and start posting! okay so..obviously i could go on and on but i won’t…i will just say that we are as close as a call and an email. We have no magic wand to lead you to success but YOU DO. Thanks for joining and please tell others about us. I will be in Nashville in the beginning of october, so I plan to book a mentoring session while I’m there.